Just picked this up. Plan on fairing and painting it ASAP. I think I will use interlux perfection, rolled and tipped, unless anyone has better suggestions. Think I need to put any glass over this section of deck, or just fill and fair it? On a previous boat I applied new gelcoat like it was paint and then mixed the mekp in styrene and misted the hull. It worked just fine and was so much easier than mixing small batches at a time. I like the perfection also. It was a bit slippery when wet though. windflower On a previous boat I applied new gelcoat like it was paint and then mixed the mekp in styrene and misted the hull. It worked just fine and was so much easier than mixing small batches at a time. I like the perfection also. It was a bit slippery when wet though. are you saying you sprayed gelcoat without mekp in it and only coated the gelcoat with mekp after you applied the gelcoat? The deck has some exposed glass fiber and the gel coat is sanded through. I don't think you need additional fiberglass reinforcement unless the deck deflects excessively or show other signs of being thin and needing structural reinforcement. On most cats the area needed glass layers is usually along the bottom of the hulls if they have been dragged over beaches or worn. The biggest task on this boat is going to be preparation fairing and sanding work. The final coatings can be either gel coat or Perfection. If you go with Perfection, it will require careful priming and figure on 2-3 coats of final finish. From personal experience, Perfection gives a very hard durable, high-gloss finish, but it shows every imperfection in the prep work. It is thin and won't cover problems. It is also pretty darn toxic stuff, so you need ventilation and a good organic respirator. Gel coat is more forgiving, and its finish is derived from final sanding and polishing. If anything goes wrong or it needs repair, gel coat can be sanded and refinished while marine paint is basically a sand and repaint. You have experience with gel, that is probably a better choice, especially if you don't have large areas of epoxy repairs. For gel coat, spraying or rolling a catalyzed material and coating with PVA spray, or using a wax mixture/ vapor suppressent in the gel coat is a better way to ensure hardening than to paint with MEKP. Edited by tominpa on Apr 10, 2019 - 10:10 AM. I think the first thing that needs to be asked is why was it sanded down to begin with? If it was damaged, then perhaps some glass work is needed. But that can’t be determined just from a single picture. I'm betting the deck is soft in that location from repeated landing by the skipper. I would check with the original owners and Matt McDonald-might be cheaper in the long run to bring the boat to Matt and have him sort the glass and paint work out properly, then apply EVA non skid yourself (he probably has a kit). Personally I would roll and tip color matched gelcoat, or spray. Lots of sanding required either way to get a smooth finish out of the mold. Perfection is a decent paint but won't match the original finish and I find gelcoat easier to work with in the finishing steps than any paint. I've sprayed gelcoat over a whole hull before and I have absolutely no desire to do it again. I think the reason the deck is like that was for a daggerboard trunk repair. A little further forward the skin was drilled and injected. 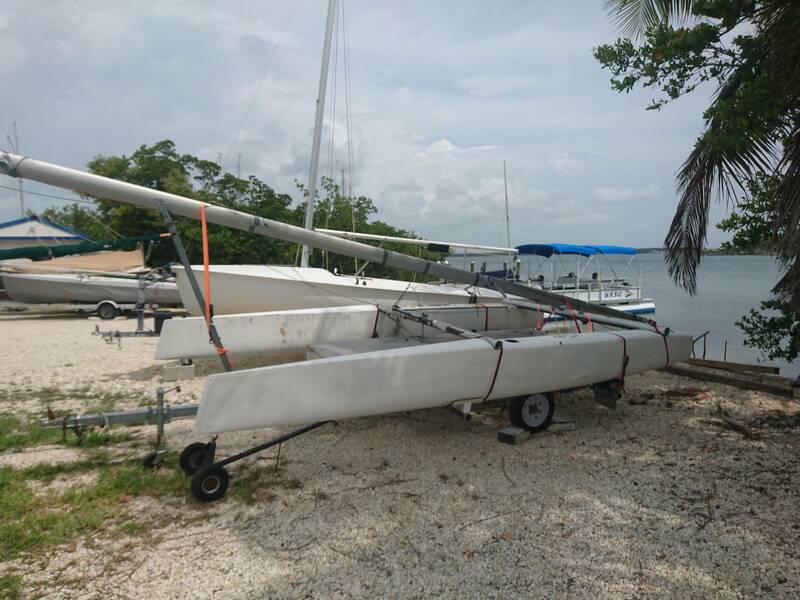 I know on my old nacra the deck plates there were a weak spot. I'll definitely be putting some kind of foam nonskid. 1) Spray gelcoat, spray pva, then remove PVA and hope things worked out or otherwise you are dealing with orange peel. 2) Spray perfection, which is about the same amount of work but any 2 part PU is deadly when sprayed and you'll end up with a spot that doesn't color match the hull and fades completely differently from the hull. 3) Roll and tip xyz, which solved the deadly bit of 2 part paints but I have NEVER successfully flowed paint this way and only the pros can do it from what i've seen...maybe with the right thinners/reducers/quantities you can get a 5' paint job but I'm looking for a 5" paint job or better...hence you sand the brush marks out and about 3/4 of the paint off while making a giant mess!! Masking and spraying a small section of deck with color matched gelcoat is a lot less work overall, and a lot less than spraying a whole boat. There are also folks who do it professionally and for reasonable rates. The whole boat needs to be done. See the splotchy color on the bow nearer the camera? That's not a shadow, its a paint or filler or something. And whats the secret to not having gelcoat orange peel after washing the PVA off? I couldn't even use the DA to get it flattened out because the pad would foul after about 40 seconds. Edited by ziper1221 on Apr 10, 2019 - 01:50 PM. If you're re-spraying the whole boat, you are looking at a good deal of work. You can shoot new gelcoat over old with just a rough sanding on the existing gelcoat. If switching to paint (I would use Awlcraft 2000 in that case) you have to sand down to bare fiberglass/fairing compound then shoot primer and then shoot paint. Gel Coat is normally intended to be applied against a closed mold and over-coated with the reinforcing lamination. This results in a hard set of the gel coat. 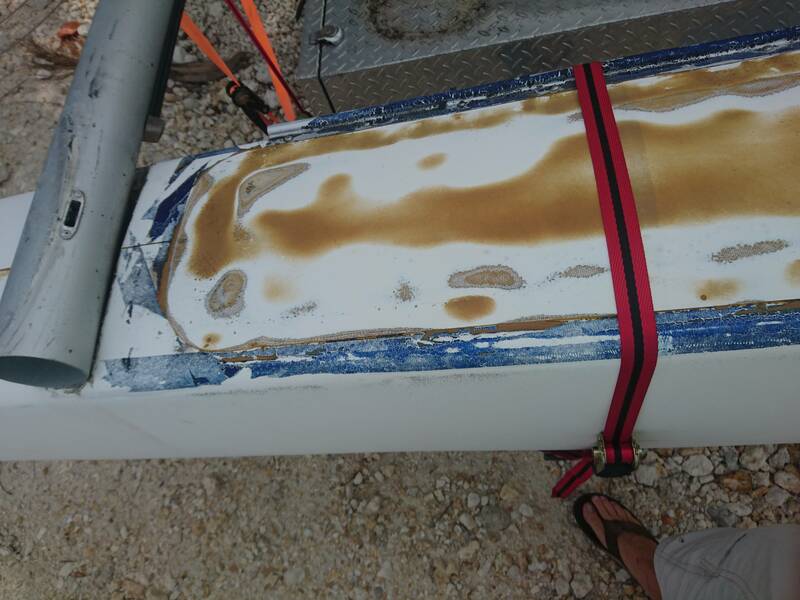 When Gel coat is sprayed on an open air hull as a paint it needs to have a vapor suppressant to ensure complete catalyzation. Without it, your get a gummy mess like you had. A surfacing agent ensures the gel coat fully polymerizes and when treated like this, it will not blind your sanding paper. Edited by tominpa on Apr 10, 2019 - 09:05 PM. Yes, except I brushed the gelcoat on the entire hull and then misted the correct amount of mekp in enough styrene to cover the area easily. Used gelcoat with wax. Applied it like it was paint. Could take all the time I needed to get a good coat since it had nearly unlimited open time. Used a house plant mister to apply the styrene. Still needed a bunch of sanding but the result was great. No issues with the sandpaper clogging. That's great, expect for the bit of aerosolized MEKP...that's a good way to go blind. how does the gelcoat on the bottom get mekp (how does it turn into a solid below the surface)? I guess since it is a catalyst it doesn't have to be in contact with every bit of gelcoat. It was a bit of desperation late at night on the first try. Didn't have any issues with spots not hardening. Think I did 4 coats total. Boat was a project I picked up for $300. It had about 10 "how fast can this thing get back on the water" repairs on the hull. No sanding or finish, just glassed over. Was so bad I took a belt sander to it. Would have taken days otherwise. I've been told by people who do a lot of glass work that this will work and is an OK way to do it. Kept the boat for 2 years after repairs with no issues.